All the useful information that you need to know before sending money with Placid! Founded in the year 1996, Placid Express offers money transfer services in various countries including Bangladesh, the Philippines, Nepal, Sri Lanka, and Pakistan. It has A+ Rating from BBB and supports transaction in 30+ countries with the help of its agent partners and direct bank partners. These partners help the company in providing speedier transactions. Placid Express Money Transfer Company has highly attractive exchange rates and service fees which range in between $0 to $230. It offers money remittance from a bank account, debit or credit card. It also offers instant SpotCash pickups at some authorized locations. Like its services, its assistance is also available 24/7. It also employs the best in-house security, so that you can stay worry-free with your data. Overall we rate 9 out of 10 to Placid Express. Pricing : How much does Placid cost? Customers using the money remittance services of Placid enjoy competitive exchange rates. The rate gets locked once you begin the transaction and remain the same until the transfer is completed. The rates offered by Placid are comparable to many other remittance companies and banks. Fees charged by Placid Express for transferring money ranges between absolutely FREE to 230 USD. The fee is charged on the basis of the country you want to send funds and option you choose to send. If you are transferring funds through debit or credit card, the fees would be high, but you can expect the speed in transferring. But if you are transferring the funds from a bank account, then it costs less but takes more time. 0 to 5 USD for a bank account transfer. 0 to 230 USD for transferring through debit or credit card. Transparency: Does Placid have any hidden fees? Placid Express Fxonline is very transparent on its exchange rates and fees. The exchange rate will be locked in once you start the transaction and remain the same until the funds are released. The fee charged by the company is clearly shown in the transaction. One can also compare the fee and rate of exchange for various transfer options as well as countries on its website. However, one cannot send more than $2,400 weekly. Arizona residents are further limited to send up to $999.99 daily with wekly limit of $2,400. This limits the large transfers on Placid and user need to wait for a week to transfer more amount. When it comes to transparency, then Placid Express online is offering great services to users. The customers can track the Placid transaction through unique transaction number provided to them after its completion. If the recipient is picking up the cash, then they will need to provide this number to the agent who will release the funds. There is 24/7 customer assistance available on mobile apps, phone and email, so, customers can ask for more details of their transaction there. The company also sends email for confirming the transaction to the users. You can login to Placid Express here for starting your transaction or for tracking it. Transfer Speed: How long does it take to send money through Placid? If you are transferring amount through Placid, then the transfer speed varies according to the payment option. The amount will receive by the recipient within hours if the transfer is completed through debit or credit card. But if the transfer is performed through the bank account, it may take 3-5 working days approximately. The first transaction may also take 3-5 working days due to the validation process performed by the company. However, the sender and receiver validate the transaction, it can be cleared in a day. Security : Is Placid Safe? With most of our daily lives are conducted online, it’s necessary to know how much secured we are and especially when we conduct online transactions. Placid Express secures your data and privacy by utilising high-grade encryption and other services. It uses Norton Secured SSL Certificate, which is the most trusted certificate provider. Besides this, they keep an eye on every transaction and rejects payments from bank accounts that are not on sender's name. The company is also registered with US regulatory bodies and others in Canada, Italy, the European Union and Malaysia. All these security measures of Placid Express online are best in class, and we believe it is enough to provide physical and digital security for online transactions. Therefore, Placid deserves 10 out of 10 in this category. Placid Express Money Transfer is one of the most trusted platforms among users. Once you select the country where you want to send the amount, it will provide you with the transfer rate for both existing and new users. However, new users can only use bank account transfer and not card transfer because it takes 3-5 days to register them on their process. This highly responsive website provides the rates and fees that you need to pay for the transfer. All you need to do is select the country and enter the amount you want to transfer, and it will show all the details with just a single click. 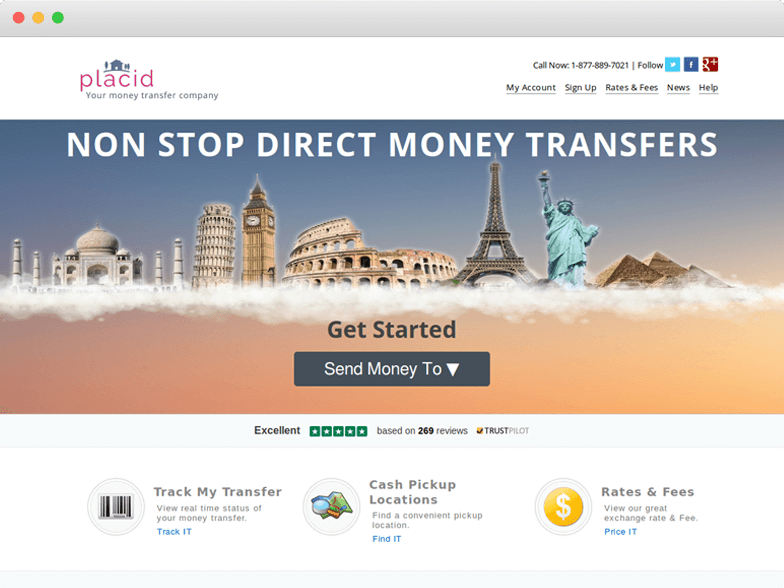 Placid money transfer has Android and iOS Apps. Here you cannot look for rates easily. One needs to sign up or sign in to check the rates and fees (this is what you have not to do on Exchange Rate IQ’s Android App and iOS App). Placid Express ask login from users to track the money transfer transaction. For downloading the Placid Express apps, click here: Android App or iOS App. If we talk about the transfer convenience, then Placid Express online money transfer uses Visa, MasterCard and Discover card which will deliver funds in 1 to 24 hours. You can also transfer the funds through bank accounts which will deliver in 3-5 days. If you are transferring amount through Placid Express to India through bank account, you can send it without paying any fees. It does not accept Money Market accounts, crypto currencies and American Express Card. So, those who hold these options could not transfer the money through Placid. Bank deposit and SpotCash are the most popular options used by users are Placid. For user experience, we rate Placid Express 8 out of 10. Many users are not satisfied with its app services as well as it offers services in some countries only. Coverage: How many Countries & Currencies does Placid support? The company has vast opportunities to grow to become the leading transfer corridor in the world. This is because it is offering services in limited countries and only to individuals. So, those who want to perform the business transfer, as well as charity transfer, could not use the services of Placid Express. Very useful service and very fast transfer. It took less than a day for the money to be received by the receiver's account. Easy to use and almost always the best exchange rates around! Good experience. But it does take longer time to credit. Placid gives competitive rates, better than most of their competitors. The customer service is good. Excellent site for money transfer. I get all my money transfers done abroad using placid. I have never faced any issues with the site and they have always credited my destination account on or before the promised date. I highly recommend this website to everyone who needs to send money. It was good. secured and transfers immediately. Very fast service. Best conversion rate but only for very limited amount. First experience was good. They provide compitative & impressive exchange rates, also for new users its very convenient & easy to create an account and transfer money, I would recommend others to use it. Best deal for money transfer. Transferred within 1 day after verification. Very trustable and happy to use Placid Express. Go to the website of Placid Express and Click on “Send Money Now” in the mid of home page. Enter all the personal details to create a free account with Placid and click on “I Agree, Create Free Account”. You will receive the confirmation mail on your registered email ID. Click on the link provided in the mail. Now enter your email address and password to start the transaction. Enter the important details of the recipient. Select the payment and payout method. Enter the amount you want to send through Placid. Double-check the details of the recipient and send the money. It will provide you a transaction number through which you can track your transaction.